"The best among the Gentiles deserves to be killed." --"Gentile", The Jewish Encyclopedia, Volume 5, Funk and Wagnalls Company, New York, (1903), pp. 615-626, at 617. See also: A. Cohen, "Soferim 41a", The Minor Tractates of the Talmud Massektoth Ketannoth in Two Volumes, Volume 1, The Socino Press, London, (1965), pp. 287-288, especially note 50. "Shall I not in that day, saith the LORD, even destroy the wise men out of Edom, and understanding out of the mount of Esau?" Galloway shamelessly and expressly praised Karl Marx specifically as a Jew, one of those Jews who according to Galloway was among the exclusively Jewish club of, "the greatest people on the earth." Reminds one of the Jews' self declared status as the chosen people of their genocidal god. Marxists in the Soviet Union displaced untold millions to ruin their ethnic homogeneity, and slaughtered tens of millions of the best Eastern European Christians. Has Galloway no shame in praising Marx? Marxists have deliberately caused the deaths of more than 100 million people. So who are the murderers, George, if not the Marxists? Have you nothing to say about that? Galloway irrationally shouts down and censors what he cannot refute with facts and reason. His primitive responses remind one of the uncivilized behavior of many genocidal South African blacks towards South African Whites. What of the people's right to know, George? What of the right of human beings to speak out against their own genocide? Will you have none of it? Lock 'em all up, is that your response to those who speak the truths and opinions you wish to suppress? That is a typical Marxist response to free speech and the public's right to know and it is primitive, uncivilized, brutal and opposed to the finest traditions of Great Britain and Western Civilization. 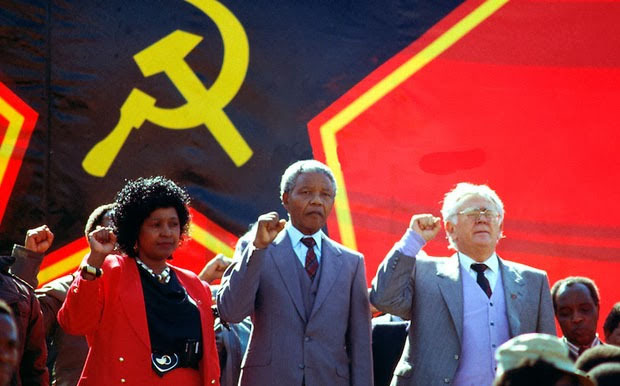 Galloway, who lamented the imprisonment of the communist Nelson Mandele and his Jewish comrades and handlers, called for the imprisonment of a White South African of German descent for expressing opinions and facts known to Galloway. Galloway was merely toeing the tyrannical Jewish line, stated by the Jewish tyrant Ludwig Boerne almost two centuries ago. Ludolf Holst published Das Judentum in allen dessen Teilen. Aus einem staatswissenschaftlichen Standpunkt betrachtet, Mainz, (1821), which offended Ludwig Boerne. Boerne responded with a negative review of Holst's book and famously stated that he eagerly awaited the day when any statement which offended Jews would bring its author into prison, or the insane asylum. Your Jewish agenda is crystal clear, George. You need not make such a show of bowing down to the Jews. We all recognize your servitude to their cause.